"Do your job, Mr. President"
I was published again yesterday. I wrote this article a few weeks ago, and it took them a while to get it printed. 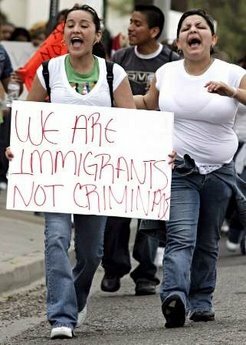 It's about this illegal immigration insanity. It's called "Do your job, Mr. President". Georges Sada: WMD flown to Syria? Georges Sada was Saddam Hussein's number two in the Iraqi Air Force. 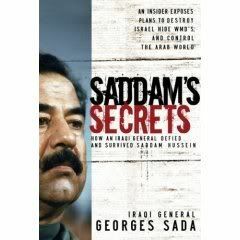 With his recent book, Saddam's Secrets, General Sada makes the charge that Saddam whisked his WMD away in the weeks prior to the US military's 2002 buildup on the Iraq-Kuwait border. "Well, up to the year 2002, 2002, in summer, they were in Iraq. And after that, when Saddam realized that the inspectors are coming on the first of November and the Americans are coming, so he took the advantage of a natural disaster happened in Syria, a dam was broken. So he — he announced to the world that he is going to make an air bridge..."
Sada goes on to say that, "They were moved by air and by ground, 56 sorties by jumbo, 747, and 27 were moved, after they were converted to cargo aircraft, they were moved to Syria." Is Sada to be believed? Thus far, conservatives have embraced General Sada's explanation, while liberals have rejected it outright. The left-leaning blog "Think Progress" refers to the Sada story as "WMD Conspiracy theories". "Democratic Underground", another leftist blog, also questions the varacity of Sada's claims, writing: "I did a Google search of Sada and found that he is a staunch supporter of the US invasion. Hmm. A high-ranking Saddam Hussein official who now supports Bush? The pieces just don’t seem to fit together here. Anybody know anything about this guy?" As usual, skepticism is warranted. Just because the guy has a story, doesn't mean that he should be believed. It's the curse of a true idealogue to believe people who tell us what we want to hear, but to disbelieve those who tell us what we don't want to hear. "Think Progress" rightfully points out that Sada never actually witnessed the massive airlift. This is second-hand information, or what might be called "hearsay" in a court of law. "I know it because I have got the captains of the Iraqi airway that were my friends, and they told me these weapons of mass destruction had been moved to Syria," said Sada. It makes you wonder why the two pilots themselves haven't come forward. "Think Progress" also points out that chief US weapons inspector Charles Duelfer of the Iraq Survy Group (ISG) has said that the scenario of Iraqi WMD's being moved to Syria is "unlikely". But his predecessor on the ISG does not agree with Duelfer. "There is ample evidence of movement to Syria before the war -- satellite photographs, reports on the ground of a constant stream of trucks, cars, rail traffic across the border. We simply don't know what was moved." These documents indicate Iraqi interest in the transfer of technology for surface-to-surface missiles with a range of 1300km (probably No Dong) and land-to-sea missiles with a range of 300km. The document quotes the North Koreans as understanding the limitations imposed by the UN, but being prepared "to cooperate with Iraq on the items it specified"
Of course the North Koreans were worried about the "limitations imposed by the UN". Iraq was prohibited long range missles, although they still managed to procure them anyway. We know that, because prohibited long-range missiles have been found in Iraq. But apparently there are is no evidence of WMD. That was just Bush's slate-of-hand trick to get the United States to invade Iraq. I guess it never occured to him that a lack of WMD's after-the-fact might not bode well for his poll numbers and reelection prospects. It must also not have occured to him to at least drop some WMD here or there to vindicate himself. Which brings us back to Georges Sada. Is he to be believed? Well, he is certainly a partisan man. I'm not so sure he's "pro-Bush" as "Democratic Underground" claims, but he is pro-liberation. He sees what's happening in his country right now--free speech, free elections, the trial of a The Butcher of Baghdad--and he likes it. Having spent many years in the West, and having a Christian background, Sada often felt himself at odds with Saddam Hussein. Nonetheless, he was a trusted confidant of Saddam, who frequently took the general's advice. In fact, Georges Sada may have been one of the few decent men in a den of snakes. American Colonel David Eberly (retired) spoke on the humanity of General Sada. Eberly was an American pilot who was shot down and captured during the first Gulf War. "Qusay (Hussein) had ordered [Sada] to execute all the pilots," said Eberly. "But Georges wouldn't do it. He argued that the rights accorded to prisoners under the Geneva Conventions were inviolable." According to Eberly, General Sada was later arrested and held by the Iraqi Republican Guard. Later, Saddam changed his minds on the executions, and Sada went on to be an Iraqi officer in good standing. And thank God that in the last war, we were so supposed to attack Israel by like eight aircraft, all equipped with nuclear — chemical weapons in two waves, one wave through Jordan and the other wave through Syria, without telling Syrians and Jordan about that. But I mentioned to the president, "Sir, this is going to be a disaster, because Israelis have got plans to destroy these airplanes before they go to Israel. Although whatever air defenses are good, but still some aircraft can penetrate." But apparently this man cannot be trusted. After all, he's just another Bushie, where as we all know that Saddam is to be taken at his word. Right. One part of Sada's statement jives quite well with the intelligence we have. Keep in mind that Sada claims that the weapons were moved "by air and by ground." Compare that to David Kay's comments that "There is ample evidence of movement to Syria before the war -- satellite photographs, reports on the ground of a constant stream of trucks, cars, rail traffic across the border." Clearly, there was a massive amount of traffic going to Syria just before the war. Who or what was being moved? If not WMD's, then what? We may never know if General Sada is telling the truth. I guess the jury is still out on that one. As it stands now, Syria has refused to cooperate with the United States in the War on Terror, and has denied harboring Saddam's weapons stashes. Meanwhile, they are funding terrorists who are killing women and children in Iraq. Nonetheless, Georges Sada will continue to be a thorn in the side of the Left. When senior government officials in the Saddam regime say that Saddam possesed weapons of WMD, it casts a lot of doubt on the idea that "there was no evidence of WMD in Iraq". That statement is just simply not true.